EAST Anglian Railway Museum-based Bagnall 0-6-0ST Lamport No. 3 (2670/1942) is on the road to a return at Chappel & Wakes Colne station, having not steamed for almost 15 years. The ex-Stewarts & Lloyds loco is undergoing a major overhaul at the museum, following its move from the Battlefield Line in March 2013. 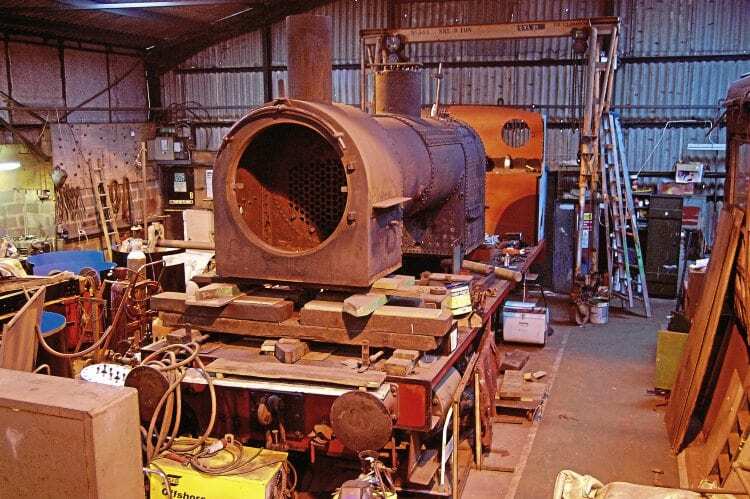 ‘Lamport’ has been partially dismantled and the boiler lifted, but not removed, in order for the stays to be removed prior to replacing the life-expired steel firebox. The intention is to replace this with a new all-welded steel firebox. Once the boiler is fully lifted the wheelsets will be removed and dispatched for tyre turning. Work will then focus on overhauling the frames and renewing a damaged horn block. Certain cosmetic work has already been completed on platework around the cab and bunker, which has been repaired and painted. The steam heating and vacuum brake assemblies will also need to be rebuilt. However, work on the Bagnall is temporarily on hold while ‘Thomas’-outline Robert Stephenson & Hawthorns 0-6-0ST No. 54 (7031/1941) undergoes a routine major boiler examination. Another ex-Stewarts & Lloyds engine – No. 54 – is receiving relatively minor repairs, including replacement of some foundation ring rivets and front tubeplate rivets. The internal main steam pipe has been removed to facilitate renewal of the studs that secure the main steam pipe elbow to the front tubeplate.